SERDANG – The Putra Motorsport Team (PMT), Faculty of Engineering, Universiti Putra Malaysia (UPM) is introducing a latest car model, Lekir, to participate in the competition of Student Formula Japan 2018 this September. 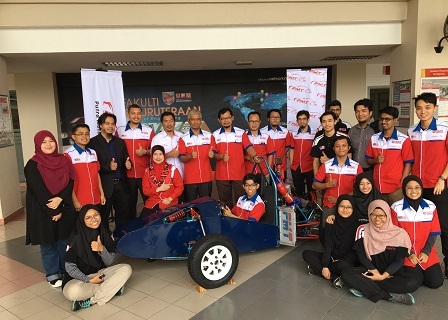 The team leader, a student of Bachelor of Mechanical Engineering, Faculty of Engineering, UPM, Ahmad Iffan Zailani, said that PMT is a team specially formed by the Department of Mechanical and Manufacturing Engineering (KMP) to ensure motorsports activities take place at UPM. “PMT is a flagship project of the Department of KMP, and the programme, Project L Launch Day, aims to promote the Putra Motorsport Team (PMT) to industry and public sector,” he said. He added that the design of Lekir is an improvisation of Jebat (Car model of 2016). The size of Lekir is smaller than the previous car in which the height is 20mm lower than Jebat, the width is 300mm narrower than Jebat, and the length is 200mm shorter than Jebat. “The design of Lekir is inspired by the motive of lightweight in which each part has a minimalist design but at the same time keeping safety a priority. “In terms of the engine power, it no longer uses horsepower data as the dyno test is no longer done, while the cockpit for the driver is more ergonomic and comfortable despite being very compact, he added. He said that the weight of Lekir is 250kg, which is a reduction of 143kg from the previous car. The PMT members include Muhammad Adhar Bagus, Anderson Kent Anak Robert, Siti Khairiyah Sulaiman, Umairatul Afiqah Md Nazri, Nur Fitriana Ma’aruf, Vinod Raj D. Senivasagam, Farhana Nazri, M.Krishnaraja, Nor Farzana Mohd Razali, Chuan Khang Wei, Wong Shy Kit dan Razzan Rosli. Meanwhile, the involvement of PMT in the competition of Student Formula Japan (SFJ) in 2016 has exposed students to car racing competition, including the technical and management aspects.